They were all fed the same diet…but only one is overweight. A couple of papers regarding obesity research have come out in the past week that may be of interest if you are a science nerd like me. Another study done by researchers in the UK illustrates that a gene involved in the development of the hypothalamus (which has a role in regulating hunger) contributes to severe obesity as well. 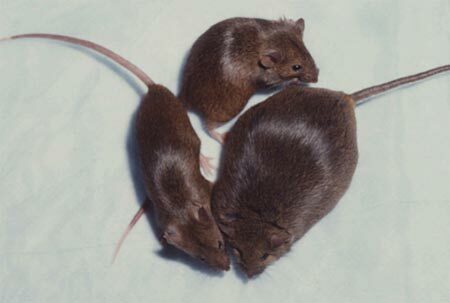 The SIM1 gene, when found in the heterozygous condition (SIM1 +/-) in mammals causes them to gain weight even when fed equally as mice who are homozygous for the SIM1 gene (SIM1 +/+). It is thought that an altered signaling pathway involving the mutant SIM1 protein during hypothalamic development is what causes the weight gain in heterozygote mammals. Both of these studies provide further proof that the process of losing weight is not as simple as “eat less, move more.” Personally, I have always thought there were genetic components and until recently, those thoughts were not supported by evidence. Reading studies like these validates what I’ve thought all along and demonstrates that obesity is a multi-factorial disease process whose complexity is yet to be fully understood. This entry was posted in genetics, obesity research, science and tagged biology, biology is awesome, genetics, genetics and obesity, i'm a biology nerd, obesity research, research, science, scientific papers. Bookmark the permalink.